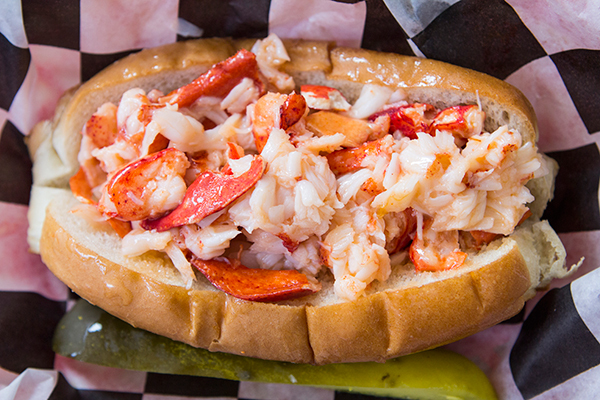 We can’t think of anything better on a summer day than a good crab cake sandwich or a fresh lobster roll and there are two locations on the waterfront in National Harbor that specialize in both. 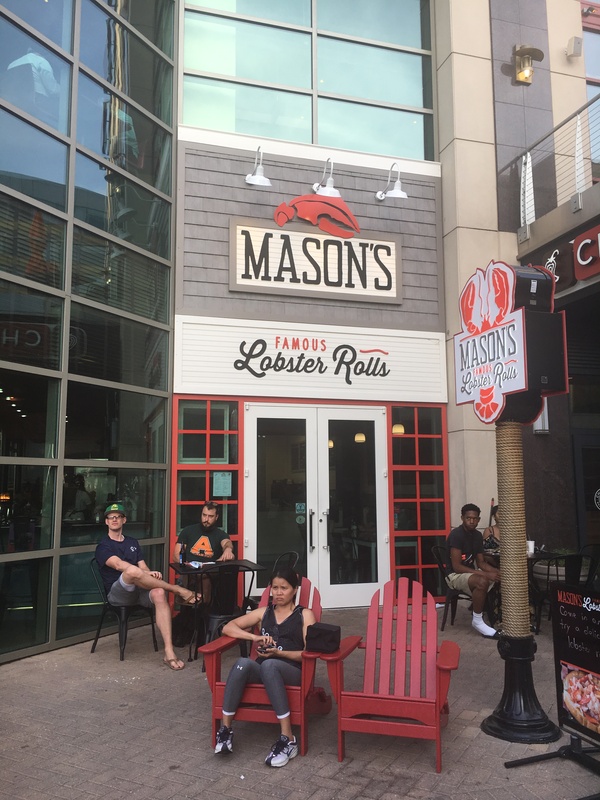 Crab Cake Café and Mason’s Famous Lobster Rolls are the “brain children” of two local Marylanders. The Crab Cake Café is a spin-off of the very popular Jerry’s Seafood enterprise whose roots are in Southern Maryland and Mason’s Famous Lobster Rolls were the end result of former local restaurant seafood buyer, Dan Beck. Both restaurants are located on National Plaza on the water in National Harbor, MD. This street is basically the Harbor’s Waterfront Restaurant Row and is home to those eateries one would consider “fast food” with the likes of Chipotle, Mezza, Ben and Jerry’s, Pot Belly. While both Crab Cake and Mason’s are considered “fast food”, they are certainly a cut above the other fast food completion on the street. In addition to their location in the Harbor, the similarities between these two places continues in both the quality and consistency of their wares. Having dined at both places multiple times, every time has been a great experience. Both of these restaurants have been my “go to” places to grab some really good eats at a reasonable price when company comes to town. The only drawback is that they are very popular and on weekends and when there is an event in the Harbor the lines can be quite daunting. The trick is to schedule your trip during the week or be prepared to for the wait – it is worth it. All of the rolls are served on a perfectly toasted bun. Also on the menu is a shrimp roll, lobster mac and cheese, salads made with lobster and/or shrimp and a lobster grilled cheese. You can add a cup of lobster bisque or New England clam chowder, potato salad, coleslaw or chips if you so desire. They also have a Nathan’s all beef hot dog or grilled cheese for the kids. For the record, my favorite is the Lobster Salad Roll! 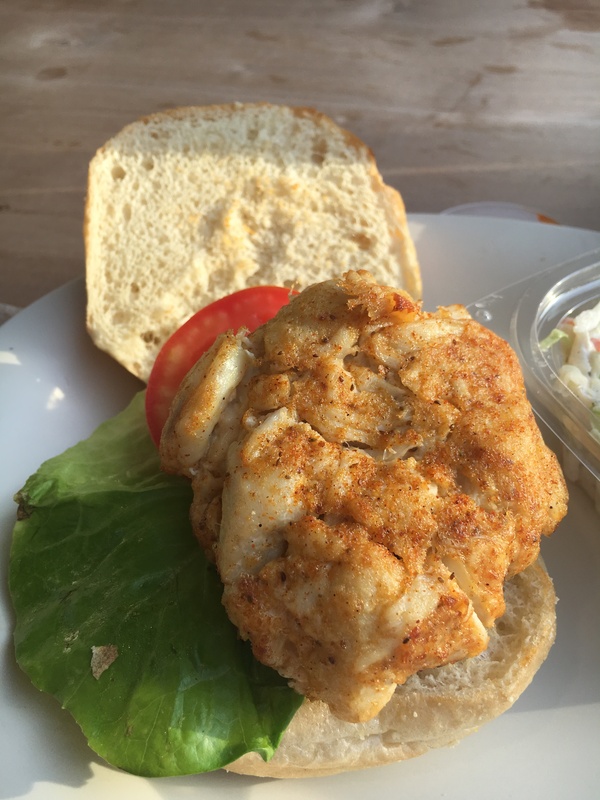 Crabcake Café is a result of the desire of the owners of the popular Southern Maryland Jerry’s Seafood to try their hand in the quick service industry. You local readers who are crab cake aficionados are probably familiar with their famous “Crab Bomb”. We have been patronizing Jerry’s for many years and that might explain why the crab cakes at Crab Cake are so good. 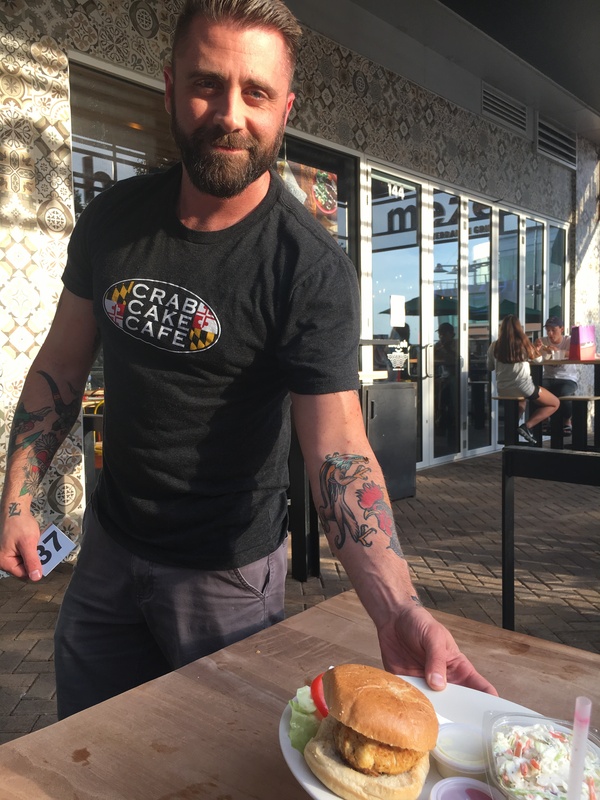 When I asked Joshua Sampson, the General Manager, why they didn’t capitalize on the Jerry’s name/reputation, he told me that they wanted Crab Cake Café to make a name for itself and to stand on its own. Well…it certainly has done that. While Jerry’s sticks with the traditional, Crab Cake Café has taken on a new “twist”. 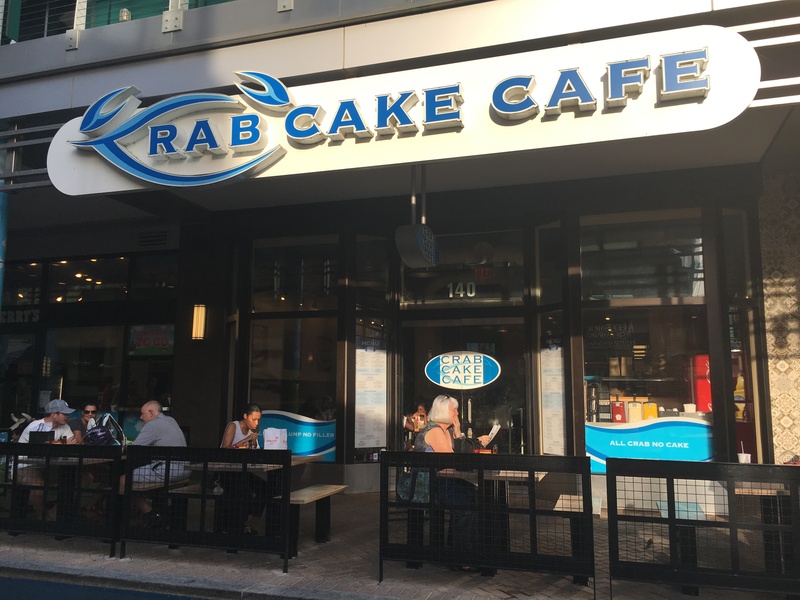 The original Crab Cake Café opened in Annapolis and had a successful 3 year run but decided that National Harbor would be a good place to be. Joshua tells me, “Crab Cake Cafe’s all fresh, hand-picked all jumbo lump crab cakes and homemade soups found a new home in National Harbor where it has grown from a local favorite, to a favorite among customers traveling the Maryland, DC area from all over. Starting with local Maryland flavors, we “twisted” them with flavors from other regions, to create six unique flavors of crab cakes! All made with generous amounts of fresh, hand-picked, jumbo lump crab meat and made in-house daily. Our dedication to using fresh and high quality ingredients can be seen (and tasted!) in all six flavors of crab cakes, sauces and three home-made soups.” He is dead on with this description so we don’t have to pontificate much more. The Traditional, Shrimp & Crab and Firecracker are served with tartar and cocktail sauce; the Hawaiian and Tex Mex with a chili lime sauce and the New Orleans is accompanied by remoulade. While I haven’t stepped outside of my “Traditional Maryland” style crab cake box, I might go crazy some day and order the Hawaiian. The crab cakes come with a choice of side – Old Bay cheddar corn muffins, hand cut fries or coleslaw. They have offerings for the landlubbers out there – Chesapeake chicken club and the Vegetarian sandwich. Obviously they have both versions of crab soup – Maryland and Cream of Crab – and the kids can enjoy a PBJ or grilled cheese sandwich and homemade mac n’ cheese. Neither of these establishments serve alcohol but the choices of beverages are numerous at both. Mason’s offers a selection of organic sodas including the Maine Root Soda in addition to the traditional soft drinks. Crab Cake has a high tech soft drink machine that has too many choices to list here.